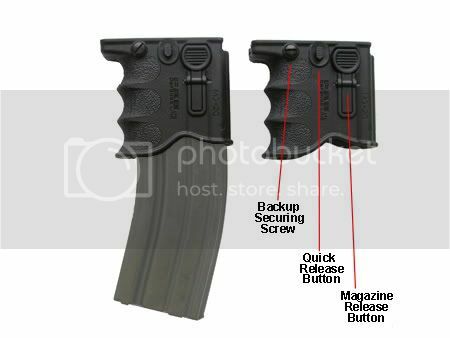 The MG20 serves as a spare mag carrier, but also as a unique ergonomic fore grip.
. Quick Release button - just slide the grip onto the rail.
. Backup Locking Screw - Should you decide to lock it in place when not using the quick release mechanism.
. Magazine release button - similar to the AR15/M16 one - to quickly release the magazine.
. Can be used asan ergonomic foregrip even without the magazine inside.